A story of creative risk-taking and turning challenges into opportunities. Fifteen sticks of basswood, a tube of glue, a bunch of instructions, guidelines, and some hints: these are the only materials given to students in Upper School physics for the infamous Bridge Project. The students have four weeks to build a bridge that will hold the most weight possible and garner votes for craftsmanship, creativity, realism, beauty, and best name, before putting the bridges to the test. This year started out like previous years, with the students hard at work on their bridges. 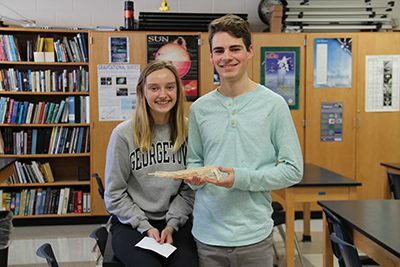 After the bridge testing, however, it was clear that something special had happened; two MPA seniors, Gabby Law and Henry Peterson, set an outstanding new record that would go down in MPA Bridge Project history as the bridge that held the most weight. Their bridge weighed 21.05 grams, and held an astonishing 319 pounds, which was 6,900 times its own weight. The previous record held just under 2,400 times its own weight. The community has taken an interest in the project over the years, with various spectators attending the bridge breaking event. Among these is Chico Hathaway, a professional civil engineer and a parent of two alumni. Hathaway has been helping with the bridge project for several years, and has provided assistance to both the students and Mr. Shapiro. The initial idea came from Mr. Shapiro advising that the students should use a lot of triangles, because they can handle a lot of force. “I turned to Henry,” shared Gabby, “and sort of joked that we should just make a gigantic triangle.” Next on the list of tips the students received, was a point that advised them to think about where the bar should go, which was going to hold up the bucket with the weight. “I thought back to a time years ago when I was climbing a tree and there was a branch that was pretty weak. I figured out that standing really close to the trunk didn’t exert as much strain … So, we wanted to put the bar really as close to the table as possible,” says Henry. Their first design ended up being an asymmetrical one, sort of resembling a fish hook. After trying it on the online simulators, however, they soon realized that trying to bend wood in such a way would be a big challenge, so they simplified it. Their second design was very similar to their final one, and they tested their prototype. When it was their turn to test their bridge, however, they found they had to keep adding more and more weight. They ended up putting another bucket on top to be filled with sand, in addition to the one that was hanging below already filled with sand and weights. 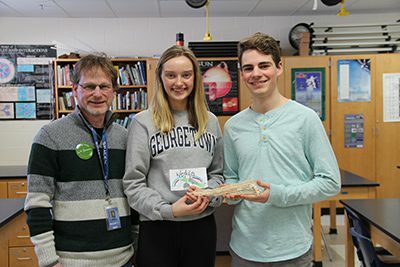 When their bridge finally snapped under the weight of 319 pounds, Mr. Shapiro performed the calculations and realized Gabby and Henry had broken an incredible school record. Gabby and Henry credited their MPA education for preparing them so well for this project. “At MPA, I think the teachers do a great job of letting students really come up with new ideas, but also pointing out with their experience possible issues or ways to improve those ideas,” says Henry. “I’ve definitely felt that my ideas are heard, and I can come up with new things, and also see what’s going to be successful and what might not be successful.” He adds that he was proud that as a senior, he was able to show the MPA community how as the leaders of the PreK-12 community, older students can come up with these really cool ideas and be role models for younger students. Gabby reflected on how what started as a joke, became something much more: “Sometimes a joke or a crazy idea can turn into something really cool, really successful, and really beautiful.” She said that she was proud to share with the MPA community a tangible example of how thinking outside the box can come with unexpected, wonderful results. To hear the students tell the story themselves, click here.